Presbyopia does not occur suddenly. It is the consequence of the slow and progressive universal decline in the amplitude of accommodation with age. A young eye, while fully corrected for distance vision, can accommodate as much as 15 diopters (D); ie, see clearly at 6.7 cm (2.6 inches) from the cornea. This remarkable ability of the young eye to focus over a large range from infinity to 2.6 inches within a second is due to a change in shape of the lens. The lens is a transparent biconvex spheroid suspended at its equator by zonules, which are connected to the ciliary body. 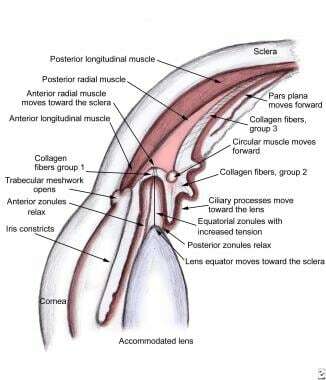 When the ciliary muscle, which is located within the ciliary body, contracts, tension on the zonules is altered, resulting in a change in the shape of the lens. There are 2 different theories on how ciliary muscle contraction alters zonular tension to increase the optical power of the lens during accommodation. Importantly, steepening of the peripheral lens surface means that Helmholtz’s theory predicts that spherical aberration shifts in the positive direction during accommodation. In contradiction to this prediction, it has been definitely proven that, during accommodation, spherical aberration shifts in the negative direction as a consequence of peripheral lens surface flattening. 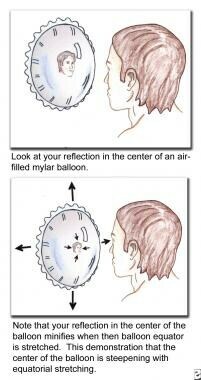 The Schachar mechanism can readily be demonstrated with an air-, water-, or gel-filled biconvex Mylar balloon. Counterintuitively, when equatorial force is applied to a balloon with an aspect ratio (minor axis/major axis) of 0.6 or less, its central surfaces steepen and its peripheral surfaces flatten. This shape is called a "steep profile" and is a universal phenomenon, which can be demonstrated in floating oil films, vesicals, and water droplets floating in space. The formation of a steep profile may explain the evolution of a discy elliptical galaxy into a lenticular galaxy. Note the image below. Reflection in the center of the balloon. The reflection from its periphery enlarges, as depicted in the image below. Reflection in the periphery of the balloon. This counterintuitive phenomenon occurs independently of the wall thickness of the balloon. The human lens, which has an aspect ratio of 0.6 or less throughout life, responds in a similar manner. When an equatorial force is applied to the human lens, its peripheral surfaces flatten, and, surprisingly, its central surfaces steepen (radius of curvature decreases) and its central thickness increases. This shape change makes the accommodative mechanism efficient so that a large increase in central optical power can occur in response to minimum ciliary muscle force (ie, ≤5 g of force). During accommodation, the equatorial diameter of the lens is increased in response to equatorial zonular tension, as shown in the following image. In the unaccommodated state, all the zonules are under tension (a). According to the Schachar mechanism, in the accommodated state, the equatorial zonules are under increased tension, and the anterior and posterior zonules are relaxed (b). As demonstrated mathematically, this unexpected shape change occurs during accommodation to ensure the lens surfaces are in a minimum-energy state. The flattening of the peripheral lens surfaces results in the negative shift in spherical aberration that occurs during accommodation. In contrast to the Helmholtz theory, the Schachar mechanism states that, during accommodation, there is increased tension applied by the equatorial zonules to the lens while tension applied by the anterior and posterior zonules is reduced. During distance vision, the tension applied by the equatorial zonules is reduced and the tension applied by the anterior and posterior zonular is increased. This ensures that there is always some tension on the lens so that the lens is stable at all times. 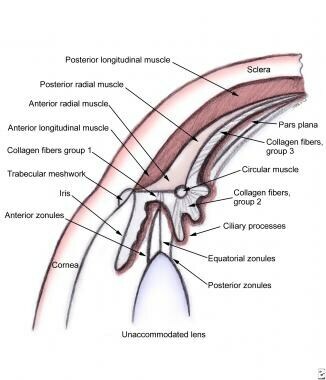 The equatorial zonules function similarly to the tendons, and the anterior and posterior zonules act like the ligaments of a musculoskeletal joint. For example, when one flexes the elbow to lift a weight, the biceps tendon is under increased tension, while the ligaments of the elbow joint are under reduced tension. Schema of the configuration of the eye in the unaccommodated state. Schema of the configuration of the ciliary body in the accommodated state according to the Schachar theory. Equatorial lens growth is the etiology of presbyopia. The lens is ectodermal in origin and therefore continues to grow throughout life. New lens fibers are continually formed from mitosis of the anterior subcapsular epithelial cells located near the equator of the lens. This causes the equatorial diameter of the lens to increase approximately 20 µm per year. As the equatorial diameter of the lens increases, the distance between the equatorial edge of the lens and the attachment of the equatorial zonules to the ciliary body decreases. This reduces the stretch and therefore the length of the anterior ciliary muscle fibers with age. The maximum force a muscle can apply is directly related to its length. Therefore, as the circumlenticular space decreases owing to equatorial lens growth, the maximum force the anterior ciliary muscle fibers can apply to increase tension on the equatorial zonules during accommodation decreases. This results in the age-related decline in accommodative amplitude that leads to presbyopia. With this fundamental understanding of the mechanism of accommodation and the etiology of presbyopia, it is possible to prevent presbyopia and increase the amplitude of accommodation. Any procedure that stops the equatorial growth of the lens will prevent presbyopia. Procedures that increase the circumlenticular space or decrease the length of the equatorial zonules or increase the force the ciliary muscle can apply will increase the amplitude of accommodation. The results were dramatic. Presbyopic patients had as much as 10 D of accommodation without a change in distance refraction. Since that time, the scleral expansion band procedure was modified by the author to avoid the possibility of anterior segment ischemia. Separate PMMA segments were placed in each of the 4 oblique quadrants of the eye to avoid compression of the anterior ciliary vessels, as shown in the images below. Incisions for placement of the polymethyl methacrylate band. Placement of the polymethyl methacrylate band. 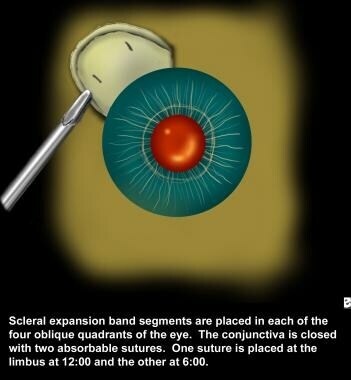 The scleral expansion band procedure was performed on more than 500 eyes. There was a mean 3.25 D (range, 1.3-7 D) without a change in distance refraction, best corrected visual acuity, or axial length. Common adverse effects that resolve in 6-8 weeks included subconjunctival hemorrhage, transient astigmatism, fluctuating near vision, and dry eyes. The increase in postoperative accommodative amplitude was very dependent on surgical technique. Placement, depth, and orientation of the individual PMMA segments were and remain crucial for maximizing accommodative amplitude improvement. The Schachar theory of accommodation has met considerable reaction and discussion, especially from those subscribing to the Helmholtz theory. Many past experiments have been published that are in disagreement with Schachar's conclusions that the crystalline lens diameter increases during accommodation. A careful examination of these experiments reveals that a systematic error exists. Movement occurs between the imaging device and the eye. Measurement of central and peripheral thickness of the cornea in the accommodated and unaccommodated states of these experiments reveals a change in corneal thickness and curvature. Since corneal curvature and corneal thickness do not change during accommodation, these experiments are flawed and cannot be used to reveal the mechanism of accommodation. Experiments by Glasser and Kaufman  and their groups are similarly flawed. Although they placed sutures in the cornea as a reference point, neither the sutures nor the corneal Purkinje images of the accommodated and unaccommodated images register, demonstrating that eye movement occurred between the imaging device and the eye. They stated that the small amount of eye movement observed in their experiments cannot account for the changes in the crystalline lens size and configuration during Edinger Westphal or pharmacologic stimulation; however, they offer no controls to prove that this statement is true. Interestingly, when they fixated the lateral rectus so that eye movement was reduced, they observed that the crystalline lens equator moved toward the sclera, with anterior and posterior zonular relaxation. They state that the movement of the crystalline lens equator toward the temporal sclera is caused by lateral translation of the crystalline lens. This is mechanically impossible. 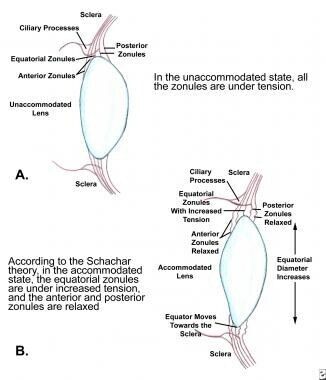 Since the crystalline lens is denser than water and vitreous, when the anterior and posterior zonules are relaxed, the crystalline lens equator can only move toward the temporal sclera by an active generated force (eg, by the pull of the equatorial zonules). Schachar and Kamangar  have used computer image analysis to correct for the spurious eye movement and registered the images from the experiments of Glasser and Kaufman. When this was done, the lens equator moved toward the sclera, less than 100 µm, as predicted by the Schachar theory. Measurement of the transverse diameter of the globe, the corneal diameter, and the equatorial diameter of the crystalline lens in the unaccommodated and accommodated states of the MRI images by Strenk et al demonstrates that all these measurements decrease during accommodation. This means that the image plane of the eye in the unaccommodated and accommodated states was not the same. Their observations are due to artifact, and any conclusion that they make concerning the mechanism of accommodation from this MRI study is not valid. The consequence of not using controls, image correspondence, and registration is that it leads to erroneous conclusions. For example, Strenk et al have claimed that the lens compresses during accommodation and that the equatorial diameter of the lens does not change with age. Since the density of the lens is equal to 1064 kg/m3 and the speed of sound in the lens is 1641 m/s, and both remain constant with age, the bulk modulus of the lens is approximately 2.8 GPa throughout life. The speed of ultrasound does not significantly change with accommodation. Therefore, the lens is negligibly compressible with a bulk modulus similar to water. The lens stroma is totally of ectodermal origin and, therefore, grows throughout life. The stem cells of the lens are located at the lens equator. The embryonic lens is essentially spherical, and, at birth, the lens is a long oval with a minor-to-major axis ratio equal to approximately 0.6, which decreases throughout life as a result of lens equatorial growth. The equatorial diameter of an infant's lens is approximately 7 mm, and the equatorial diameter of a 70-year-old patient's lens is approximately 9.6 mm. The small amount of equatorial crystalline lens movement explains the problems and the systemic errors that have occurred during previous experiments that try to determine the position of the crystalline lens equator during accommodation. Eye movements are much larger than the movement of the crystalline lens equator; therefore, proper controls are essential to interpret any measurements. The healthy, young human (< 40 y) or young primate eye can rapidly focus on near and distant objects (ie, it can change focus or accommodate). The mechanism by which the eye can accomplish this amazing task has been speculated upon for centuries. Initially, it was suggested that the eye was divinely created; therefore, it did not follow known physical laws of optics. In 1619, Scheiner, a Jesuit priest, proved that accommodation occurred as a result of a change in the optical power of the eye and that the eye obeyed the laws of optics. His experiment easily is duplicated and consists of making 2 vertical pinholes in a card, which are separated by less than the diameter of the pupil of the eye. The observer looks through both holes simultaneously and focuses on a needle held perpendicular to the plane of the holes. When focusing on the needle, it will appear single; however, if the observer focuses on a more distant or near object, the needle will appear doubled. This simple elegant experiment demonstrates that the eye functions as an optical system. The explanation of Scheiner's experiment is demonstrated in the image below. Consider a point source of light as the object. A convex lens converges the rays of light to a point. By placing a card containing 2 holes between the point source and the convex lens, only 2 rays are brought to a focus. If the power of the convex lens is changed, then the 2 rays are brought to a focus at a different distance. The point source appears doubled at all other distances. If the card has 3 or 4 holes, the point source will triple or quadruple. Next, he calculated the amount the cornea would have to move forward to account for his accommodative amplitude. Using candles and a front surface mirror engraved with a scale, he did not observe any corneal movement as he changed his point of focus. He further proved that the radius of curvature of the cornea does not play a role in accommodation. He attached a convex lens possessing the optical power of the cornea to the bottom of an eyecup. He filled the eyecup with saline and placed it over his cornea (the forerunner of contact lenses). The saline in contact with the cornea eliminated the refractive power of the cornea; yet, he was still able to fully accommodate. Young demonstrated that accommodation did not occur in aphakes. He realized that accommodation had to result from a change in position or shape of the crystalline lens. He was convinced that accommodation could not occur because of forward or backward movement of the crystalline lens. He calculated that the crystalline lens would have to move 10 mm to account for his amplitude of accommodation. This would be impossible. Young observed that spherical aberration decreased during accommodation. He concluded that accommodation occurs as a result of a change in shape of the crystalline lens. Since the ciliary body had not been discovered yet, he postulated that the change in shape of the crystalline lens is induced by a muscular mechanism within the crystalline lens. In 1823, Purkinje noted the reflected images of a candle from the anterior and posterior crystalline lens surfaces. In 1849, Langenbeck was able to observe in a patient that the Purkinje image from the anterior surface of the crystalline lens became smaller during accommodation by using a candle and a magnifying glass. He correctly concluded that the anterior surface of the crystalline lens becomes more convex during accommodation. He proposed that the ciliary muscle, which had been discovered independently by Bruecke and Bowman in 1847, [27, 28] squeezes the crystalline lens. In 1904, Tscherning examined the curvature changes of the anterior crystalline lens surface by observing the changes in the Purkinje images when 4 lights are used as objects. He placed the lights so that 2 formed reflected images from the central anterior surface and 2 formed reflected images from the peripheral anterior surface of the crystalline lens. He observed that the central images moved closer together during accommodation, while the peripheral images moved further apart. He concluded that the crystalline lens was becoming more convex centrally but was becoming flatter in the periphery during accommodation. This was consistent with Young's observation that the spherical aberration of the eye decreases during accommodation. Tscherning postulated that during accommodation the ciliary muscle exerted tension on the crystalline lens, pressing the crystalline lens against the anterior vitreous. The resistance of the vitreous transmitted sufficient force to effect central bulging of the anterior surface of the crystalline lens. His theory predicts that the central thickness should decrease during accommodation. He did not accept Helmholtz's measurements of increasing crystalline lens thickness with accommodation. Tscherning thought that presbyopia was the result of enlargement of the crystalline lens nucleus. All subsequent theories Gullstrand (1911), Fincham (1937) used Helmholtz's hypothesis that the zonules are relaxed during accommodation. [33, 34] Helmholtz's hypothesis and subsequent modifications attribute presbyopia to sclerosis of the crystalline lens stroma or capsule, atrophy of the ciliary muscle, or stiffening of the ciliary muscle attachments. Presbyopia initially was treated with near vision optical aids using magnifying lenses, reading glasses, and monocles. Patients were constantly removing reading glasses and losing them because the reading glasses interfere with vision at all other distances. Benjamin Franklin fused the distance lens with the near reading lens to give us bifocals that were later modified to trifocals. The problem with these reading aids is that they only allow sharp near vision at a given distance and the near visual field is limited by the lens. Patients must learn to rotate their eyes downward when reading with bifocals instead of rotating their head. It usually takes 2-3 weeks for patients to get used to wearing bifocals. Trifocals can even be more of a problem for many patients. To avoid the problems of bifocals and trifocals, bifocal contact lenses have been developed. The bifocal contact lenses generally have been unsuccessful because the distance and near powers of the contact lens must be crowded into an area that can barely cover the pupil. The patient must learn how to shift the contact lens and to ignore the distant or near image according to the visual task. Multifocal glasses and multifocal contact lenses also are generally not satisfactory. Multifocal lenses produce multiple images at various focal points. Light reflected or emitted by an object must be dispersed by the multifocal lens over all the focal points. Therefore, the intensity at any given focal point will be reduced and the contrast sensitivity diminished. To avoid prismatic effects, the visual field of a multifocal lens is reduced. In addition, the patient must learn to select the appropriate image. The problems with bifocal and multifocal contact lenses forecast the problems that have, and will continue to occur, with attempts at making a bifocal or multifocal cornea using LASIK or using intracorneal lenses, phakic intraocular lenses, or aphakic intraocular lenses. Monovision as a treatment for presbyopia generally is accepted by less than 30% of the population. The loss of stereopsis and learning to ignore a blurry image from one half of the binocular visual field are problems for most patients. Based on this theory, the accommodative amplitude of presbyopes can be increased. Any technique that increases the space between the ciliary muscle and the crystalline lens equator will physiologically increase the amplitude of accommodation. Schachar RA. The Mechanism of Accommodation and Presbyopia. Amsterdam, The Netherlands: Kugler Publishers; 2012. Donders FC. Accommodation and refraction of the eye. The New Society. London. 1864. 204-215.
von Helmholtz H. Uber die akommodation des auges. Albrecht von Graefes Arch Ophtalmol. 1855. 1:1-89. Kaufman PL, Rohen JW, Bárány EH. Hyperopia and loss of accommodation following ciliary muscle disinsertion in the cynomolgus monkey: physiologic and scanning electron microscopic studies. Invest Ophthalmol Vis Sci. 1979 Jul. 18(7):665-73. [Medline]. Schachar RA, Davila C, Pierscionek BK, Chen W, Ward WW. The effect of human in vivo accommodation on crystalline lens stability. Br J Ophthalmol. 2007 Jun. 91(6):790-3. [Medline]. Schachar RA, Koivula A. The stress on the anterior lens surface during human in vivo accommodation. Br J Ophthalmol. 2008 Mar. 92(3):348-50. [Medline]. Schachar RA, Abolmaali A, Le T. Insights into the age-related decline in the amplitude of accommodation of the human lens using a non-linear finite-element model. Br J Ophthalmol. 2006 Oct. 90(10):1304-9. [Medline]. Chien CH, Huang T, Schachar RA. Analysis of human crystalline lens accommodation. J Biomech. 2006. 39(4):672-80. [Medline]. Schachar RA. 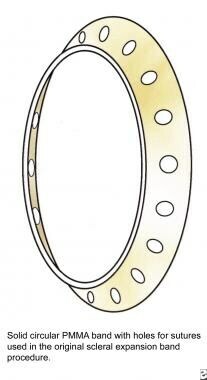 Finite element analysis and the Schachar mechanism of accommodation. J Cataract Refract Surg. 2011 May. 37(5):979. [Medline]. Schachar RA, Fygenson DK. Topographical changes of biconvex objects during equatorial traction: an analogy for accommodation of the human lens. Br J Ophthalmol. 2007 Dec. 91(12):1698-703. [Medline]. Schachar RA, Liao GG, Kirby RD, Kamangar F, Savoie JH, Abolmaali A, et al. Unexpected shape changes of encapsulated oblate spheroids in response to equatorial traction. Journal of Physics A: Mathematical and Theoretical. 2008. 41:495204 (9pp). Schachar RA, Liao GG, Kirby RD, Kamangar F, Musielak Z, Rosensteel G. Novel explanation for the shape of the lenticular galaxy bulge and its implication for red spiral galaxy evolution. Astronomy & Astrophysics. 2009. 505:613–623. Schachar RA, Pierscionek BK, Abolmaali A, Le T. The relationship between accommodative amplitude and the ratio of central lens thickness to its equatorial diameter in vertebrate eyes. Br J Ophthalmol. 2007 Jun. 91(6):812-7. [Medline]. Fukasaku H, Marron JA. 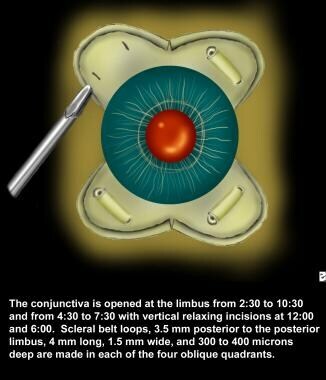 Anterior ciliary sclerotomy with silicone expansion plug implantation: effect on presbyopia and intraocular pressure. Int Ophthalmol Clin. 2001 Spring. 41(2):133-41. [Medline]. Glasser A, Kaufman PL. The mechanism of accommodation in primates. Ophthalmology. 1999 May. 106(5):863-72. [Medline]. Schachar RA, Kamangar F. Computer image analysis of ultrasound biomicroscopy of primate accommodation. Eye (Lond). 2006 Feb. 20(2):226-33. [Medline]. Strenk SA, Semmlow JL, Strenk LM, Munoz P, Gronlund-Jacob J, DeMarco JK. Age-related changes in human ciliary muscle and lens: a magnetic resonance imaging study. Invest Ophthalmol Vis Sci. 1999 May. 40(6):1162-9. [Medline]. Descartes R. Traite de l'homme. Paris: 1677. Lobe. Dissertatio de ocula humano. Vol 19. 1742. Sturm JC. Dissertatio de presbyopia et myopia. Altdorfi: 1697. Listing. Wagner's Handworterbuch d. Physiiologie. Vol 4. Braunschweig: 1853:498. Young T. On the mechanism of the eye. Philos Trans Royal Soc. 1801. 92:23-88. Purkinje, Beobachtungen u, Versuche z,Physiologie d. Sinne. Prague. 1823. 2:128. Langenbeck K. Opthal. Gottingen: 1849. Brucke. Arch Anat Physiol wiss Med. 1846:370. Bowman. Lectures on the Parts Concerned in the Operations of the Eye. London: 1849:62. Cramer N. Lancet. Vol 1. 1851:529. AdamüK E, Woinow M. Zur Frage über die Accommodation der Presbyopen. Albrecht v Graefe Arch Ophthalmol. 1870. 16:144-153. Tscherning M. Physiological Optics. Philadelphia, Pa: Keystone; 1904:160-89. V Graefe. Presbyopia: Cause and Treatment. Arch Ophthalmol. 1860;7:150. Gullstrand A. Einfurhrung in d. Methoden d. Dioptrik d. Auges d. Menschen. Leipzig: 1911. Fincham EF. The mechanism of accommodation. Br J Ophthalmol. 1937. 8:1-80. Koopmans SA, Terwee T, Glasser A, Wendt M, Vilupuru AS, Vilipuru AS. Accommodative lens refilling in rhesus monkeys. Invest Ophthalmol Vis Sci. 2006 Jul. 47(7):2976-84. [Medline]. Fisher RF. Is the vitreous necessary for accommodation in man?. Br J Ophthalmol. 1983 Mar. 67(3):206. [Medline]. [Full Text]. ARMALY MF, RUBIN ML. Accommodation and applanation tonometry. Arch Ophthalmol. 1961 Mar. 65:415-23. [Medline]. Findl O, Kriechbaum K, Menapace R, Koeppl C, Sacu S, Wirtitsch M, et al. Laserinterferometric assessment of pilocarpine-induced movement of an accommodating intraocular lens: a randomized trial. Ophthalmology. 2004 Aug. 111(8):1515-21. [Medline]. Dhital A, Spalton DJ, Gala KB. Comparison of near vision, intraocular lens movement, and depth of focus with accommodating and monofocal intraocular lenses. J Cataract Refract Surg. 2013 Dec. 39(12):1872-8. [Medline]. Ryan A, O'Keefe M. Corneal approach to hyperopic presbyopia treatment: six-month outcomes of a new multifocal excimer laser in situ keratomileusis procedure. J Cataract Refract Surg. 2013 Aug. 39(8):1226-33. [Medline]. Levinger E, Trivizki O, Pokroy R, Levartovsky S, Sholohov G, Levinger S. Monovision surgery in myopic presbyopes: visual function and satisfaction. Optom Vis Sci. 2013 Oct. 90(10):1092-7. [Medline]. Tomita M, Huseynova T. Evaluating the short-term results of KAMRA inlay implantation using real-time optical coherence tomography-guided femtosecond laser technology. J Refract Surg. 2014 May. 30(5):326-9. [Medline]. Gifford P, Kang P, Swarbrick H, Versace P. Changes to Corneal Aberrations and Vision After PresbyLASIK Refractive Surgery Using the MEL 80 Platform. J Refract Surg. 2014 Jul 16. 1-6. [Medline]. Tomita M, Kanamori T, Waring GO 4th, Nakamura T, Yukawa S. Small-aperture corneal inlay implantation to treat presbyopia after laser in situ keratomileusis. J Cataract Refract Surg. 2013 Jun. 39(6):898-905. [Medline]. Garcia-Gonzalez M, Teus MA. Nonwavefront-guided presby reversal treatment targeting a monofocal cornea after bi-aspheric ablation profile in a patient intolerant to multifocality. J Refract Surg. 2014 Jul. 30(7):440. [Medline]. Courjaret JC, Matonti F, Savoldelli M, D'Hermies F, Legeais JM, Hoffart L. Corneal ectasia after intrastromal presbyopic surgery. J Refract Surg. 2013 Dec. 29(12):865-8. [Medline]. Alarcón A, Anera RG, Villa C, Jiménez del Barco L, Gutierrez R. Visual quality after monovision correction by laser in situ keratomileusis in presbyopic patients. J Cataract Refract Surg. 2011 Sep. 37(9):1629-35. [Medline].